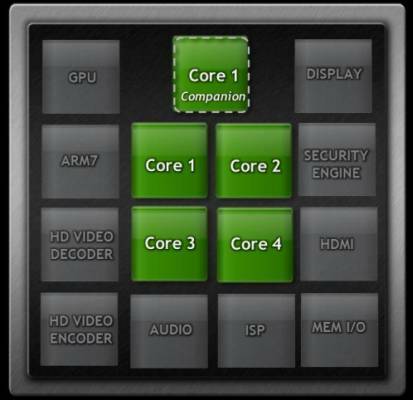 Nvidia today unveiled the technical specs for its upcoming "Kal-El" quad-core mobile processor. The world’s first mobile quad-core chip actually has a secret fifth core, which the company refers to as a "companion core," to handle less demanding tasks like Web browsing. By including this extra core, Nvidia says you can expect better energy savings and performance on tablets or smartphones. The secret, patented fifth Cortex A9 core in "Project Kal-El", Nvidia says on its blog, runs at what the company terms "a lower frequency" and operates at "exceptionally low power." The extra core is tucked away in the background, running in a stealth mode so operating systems and apps don’t need to be redesigned to make use of it. It will kick into play only when appropriate. A diagram of the Kal-el mobile processor. The fifth core will handle less power-hungry tasks like Web browsing, music playback, and video playback, allowing the other four cores to remain powered down until required for high-performance tasks like image processing or gaming. When the four cores enter into play, the fifth core powers down. The end result can be more battery efficiency and a performance bump overall of up to 50 percent compared to the Tegra 2 chip, according to Nvidia. The first quad-core Kal-El devices are due later this year.